This is the 1956 Golden Eagle Prototype. Otto Kassborher agreed to build this prototype for Continental Trailways for $46,000, assuming they would buy a large number if they liked the results. This prototype was a 41 passenger with a M.A.N. V-8 turbocharged 230hp diesel engine. The transmission was a six speed ZF Media 6M-75. This was the first Eagle built and delivered to Continental in June of 1956. The first Eagle coach was built in Germany by the Karl Kässbohrer firm of Ulm in 1956. The Eagle coach was the result of a contract between Continental Trailways in the United States and the Kässbohrer company. 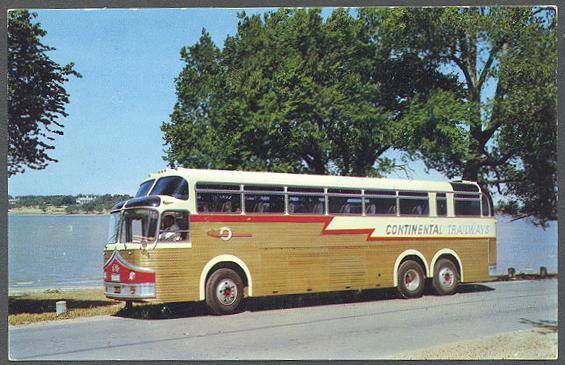 Continental Trailways was looking for a 40 foot coach to compete with Greyhound’s Scenicruiser. Unable to find a North American manufacturer who would start production on their terms, Continental started looking overseas. At least one manufacturer in Ireland was considered first, followed by at least one English bus builder. Next up was Germany where Continental considered buying Neoplan. That fell through so Continental looked to Kässbohrer. Kässbohrer had connections to M.A.N. for diesel engines and Z.F. for transmissions and was willing to work on Continental's terms. Kässbohrer was also the pioneer for integral (no separate body and chassis) and articulated buses in Europe. Their patented trailing section dominated the articulated market for nearly a decade. Continental had an idea of what their dream coach would look like and gave their requirements and sketches to Kässbohrer. Continental watched as Kässbohrer designed the new bus and approved every line on the new drawings. Continental gave their new bus the name of Golden Eagle as they acquired an eagle trademark as part of their 1953 purchase of American Buslines. In mid-1956, Kässbohrer built a single high specification 40 foot, 3-axle luxury coach specifically designed for and partly by Continental Trailways. It was a prototype and when finished it was shipped to Houston for evaluation. Continental was mostly very happy with it but asked Kässbohrer for some changes to be made before production started. In May, 1957 President Maurice E. Moore of Continental Trailways again visited the Kassbohrer factory. He signed a contract for two Academy Express articulated coaches, 50 more Golden Eagles, four Super Golden Eagles and 41 Silver Eagles for delivery in 1957 and 1958 plus 85 more Silver Eagles for later delivery. The two Academy Express articulated coaches came first in 1957. Fifty Golden Eagles with M.A.N engines and Z.F. preselector transmissions were delivered later in 1957 with the last few in 1958. Four articulated Super Golden Eagles with Rolls-Royce diesel engines followed them. Forty-five Silver Eagles were to have followed in 1958 but the number was reduced to 41 because Continental bought the two articulated Academy Express coaches from Kässbohrer in 1957 to take the place of the four missing Silver Eagles. These two were each built on an underfloor-engined Henschel chassis with Kässbohrer bodywork. They were part of Kässbohrer's standard product range for their German customers and technically were not Eagles. Later in 1958, Kässbohrer built the forty-one Silver Eagles. This factory run had the same general external look but with a lesser interior specification. Gone were the galley and tables, which were replaced with forward-facing seats. These were called Silver Eagles as the golden-colored aluminum sides were replaced with silver-colored paneling. The Silver Eagle became the new standard coach of Continental Trailways. As with the 1956 Golden Eagle prototype, Continental wanted to build up some time and mileage on these new coaches before deciding on what changes to make in the next batch. Continental wanted a new front end design and a standard American powertrain and presented these ideas to Kässbohrer, who agreed to them. Design work started and production was scheduled for the middle of 1960. Sometime in 1959 Kässbohrer decided to concentrate all of its resources on the rapidly expanding European market and wanted to wind down the manufacture of Eagle coaches. A new agreement was worked out between the two companies. In the agreement, Kässbohrer sold all of the plans, tooling and existing spare parts for the Eagles to Continental. They also agreed to supply certain assemblies and parts for the eighty-five 1960 Silver Eagles that had previously been agreed to. After that, Continental had to find a new European partner if they wanted to keep building Eagle coaches in Europe. In time Continental teamed up with La Brugeoise et Nivelles in Belgium, an old company mainly building railway equipment. With the help of La Brugeoise, Continental established its own factory in Belgium, giving it the name Bus & Car, N.V. (N.V. is the Dutch/Flemish term for Inc.). La Brugeoise assembled the 85 NEW Silver Eagles as they were called during late 1960 and 1961. In November,1961, Bus & Car, N.V. started producing Eagle coaches. They were called the Model 01 and were nearly identical to the NEW Silver Eagles built by La Brugeoise. The first Bus & Car Eagles introduced a wraparound mesh grill which remained an Eagle feature until 1969. Lower labor costs plus the fact that the tooling was already in Europe were the main reasons to build coaches in Belgium. From this point on Eagles used many imported US components such as Detroit Diesel engines, Spicer transmissions, Lockheed brakes, Carrier compressors and Ross steering gear. Bus & Car built the Model 01 until mid-1968. During 1966 production of the Model 04 for European markets started. 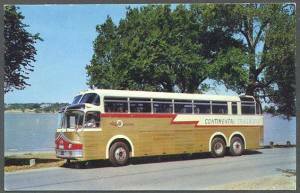 In 1967 a prototype 2-axle, 40 foot, 102 inch wide coach was built for Trailways called the Model 02 and two prototypes for the Model 05 were built using Model 01 bodies. This pair may have actually been the Model 03. Of the many running changes to the Model 01 during its lifetime, most were first seen in the 1964 models. Some were just appearance changes, but others were engineering, such as an air-operated parking brake and new air intakes for the engine. Most appearance features remained the same from 1965 through 1968 except that the front of the silver siding and lightning bolt trim that was raised to the window level in 1965 and stayed there until the 1975 models arrived. 1963 models were built with taller roofs than the others but this was for only that one year. In mid 1968, the new Model 05 was introduced but it continued to use the Model 01 body style. There were a number of internal changes but the main visible differences were the moving of the drive axle behind the tag axle and the replacement of the four small baggage doors on each side with three larger ones. Trailways listed the last twelve of these as 1969 models but that may be based on when they were titled in the USA and not when they were actually built. In 1969 the Model 05 received a squarer appearance. Bus & Car produced the Model 05 for the US market until the end of 1976. Later in 1969 and into 1970 there was a run of 45 Model 07 coaches that were 102 inches wide. They closely resembled the Model 05 and shared most of its parts. They were exclusive to Continental Trailways and were never sold to other carriers. In 1972, Bus & Car built twenty Model 09 Eagles for South African Railways. These had the external appearance of the 05, and were shorter but retained the three axles. Other exports of adapted Model 05's were made to Australia (24 coaches), Canada, Thailand and many European countries. In 1974 forty Eagle Model 14 buses were built for the Belgian Vicinal Railways (NMVB-SNCV, fleet numbers 4285-4324), using Mercedes-Benz engines and SNCV’s standard body design. Another effort at building buses for the local market resulted in the delivery of fifteen Eagle Model 16 buses with Caterpillar engines to the Brussels public transport operator, MIVB-STIB (fleet numbers 8046-8060) . The design of these buses followed the standard Brussels model that was based on a design by Philip Neerman but they featured silver skirts, a bit of Eagle silversiding about 30 cm/12 inches high that started at the lower edge of the body and went up. U.S. production started very late in 1974 and at the end of 1976, Bus & Car stopped producing Eagles for the American market. By 1978, sales had dropped so much that the company declared bankruptcy and was sold to MOL NV, a long-established Belgian builder of heavy machinery. MOL had built a small number of bus chassis and wanted to expand in this area. In total, Bus & Car N.V. built around 3,800 Eagles. 1,342 of these were Model 01 coaches. MOL Eaglebus revised the Eagle range and added the production of a separate chassis for some models. At the bus show in Kortrijk, Belgium in October 1979 MOL Eaglebus had several coaches on display. The M15 Transcontinental was the top of the range. It was derived from the Model 05 and had several interesting features such as a very tall windshield, bonded side windows, the drive axle ahead of the tag axle and the typical European low center exit door just ahead of the rear axles. Also shown were a prototype transit bus which was somewhat reminiscent of the Model 16, called the Model 17 City, and a coach named the M20 Touring. This one had Spanish Irizar bodywork on a MOL chassis. Also in 1979, Mol built three small city bus chassis with Cummins engines, the MOL Eagle M28, for Belgian Vicinal Railways for use on their Brugge city services (fleet numbers 5559-5561). These had narrow Jonckheere Trans City bodywork. In 1981-1982 a series of 25 more bus chassis, MOL Eagle M31, was built for the Vicinal Railways for use around Gent (fleet numbers 5715-5739). These had Mercedes engines and again received Jonckheere bodywork in the current 'A120' style started by Van Hool. The M17 City transit bus was demonstrated in the United States though no orders materialized. As a result of the depressed European market and strong competition, Mol only built 50 Eagle coaches between 1978 and 1987 when it closed its bus division. Parts from existing stocks sufficient to build another 50 or so Eagle coaches were on hand at the end and were scrapped around 2008. Rising labor costs in Belgium and a declining dollar resulted in the decision to shift production for the US market to the other side of the Atlantic. The Eagle International factory started delivering buses made in Brownsville, Texas late in 1974. For two years, both the Bus & Car and Eagle International factories produced coaches for the US market, but since 1977, all US Eagles were produced in Texas. The Model 05 was built until 1980, when it was superseded by the Model 10 of which 2,217 were built until 1987. In 1982 a second factory was opened in Harlingen, Texas, to produce a 2-axle Model 10 Suburban. This version met with little success as only 84 were made. In 1985 production of the 102 inch wide Model 15 (all the others had been 96 inches wide except for the Model 07). Finally, the Model 20 was introduced in 1987, which was a Model 10 with the external styling of the wider Model 15. Externally it is difficult to distinguish the Model 15 and 20. Over the years, many smaller improvements were made and some companies ordered special versions of the standard models. For example, New Jersey Transit bought a special version of the Model 20 which had very large front destination displays and large black safety bumpers. In 1988, a 2-axle 35 foot version and a 3-axle 45 foot version of the Model 15 were introduced. In 1989, smooth sides became an option. The Eagle had long ago became popular as a conversion shell for motor homes and entertainer’s coaches and this market segment was not neglected. Over 3,000 Eagles have been built in Texas, mostly for the North American market, though some were exported to Australia, Chili & Taiwan. In 1987 Greyhound bought Trailways and Eagle, but went bankrupt in June 1990. Eagle production stopped in December, 1990, and Eagle filed for Chapter 11 bankruptcy in 1991. In October, 1991 the factory was sold to a Mexican corporation as Eagle Bus Manufacturing, Inc. Bus production resumed in July, 1992, but output remained low, with a large proportion of vehicles built as conversion shells for the entertainer market. By the end of the decade, the company got into financial trouble again and filed for Chapter 11 protection in January, 1998. The Eagle trademark and product line were purchased by Maplex and activities were re-launched as Eagle Coach in August 1998 when some of the old facilities were leased from the town of Brownsville. Priority was given to the manufacturing of spare parts. Some bus production also continued in two different areas of Mexico for a while. During the mid-2000's an Eagle revival under the name of Silver Eagle Bus Manufacturing Inc. got started. The venture was undercapitalized and went bankrupt a few years later as it was unable to pay its creditors. They produced one Model 25 conversion shell of their own design and one 37 foot long Model 20 that may never have been fully completed. During its production of over four decades, some 8,000 Eagle coaches were built in four different countries on two continents They were the trademark of Continental Trailways for over three decades. Editorial note: This page has been updated based on editorial and content corrections made by Joe Richards (text submitted Nov. 2014). Also, there is considerably more Eagle bus history (including production information) in this forum. Thanks to Joe Richards, John Veerkamp for contributing this data and to Dan Lenz for the photo.